"Class outings to the zoo - we walked there, returning by tram to the front gate (editors note: in those days trams ran down Surrey Crescent and Great North Road). ovie treat - we walked to the Adelphi theatre in Richmond Road, later renamed the Esquire. Annual fundraiser bottle drive. Most boys brought their trolleys to school packed with all shapes and sizes of bottles. These were laid out in their various types on the hard court. The empty trolleys were used for playground rides at lunchtime. Returning home after school on bottle day was especially exciting for those of us who lived around Western Springs. From the back gate on Great North Road it was a fast ride down the footpath to Western Springs shops." Mr Rowden recalls that his school years were those of World War Two. 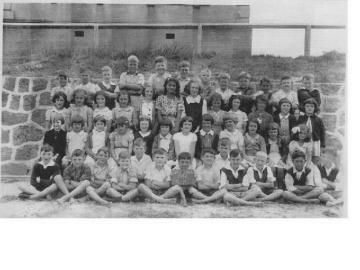 "One weekend saw a working bee with parents and children digging trenches for air-raid protection in the area known as 'The Plantation' (editors note: now the school forest behind the swimming pool). Another weekend project was to dig out the base of the new swimming pool on the level ground above the plantation slope (near today's Room 7). From 1941 parents made us small cotton pouches containing cotton wool for our ears and a cork to be held between our front teeth. The air-raid siren was on pole just outside the west end gate on Surrey Crescent (where the big rubbish bins are). Rationing was in place for clothing, many foods, petrol and dairy products. Coupons were issued in booklets by the NZ Government." Because of dairy products being rationed Mr Rowden gave us a recipe for Mock Cream.
" 1 cup of milk, 3 heaped teaspoons of milk powder, 2-3 drops of vanilla, 1 teaspoon of sugar. Beat well then stand for half an hour in the chiller. Chillers were ice boxes people used before they had refrigerators."